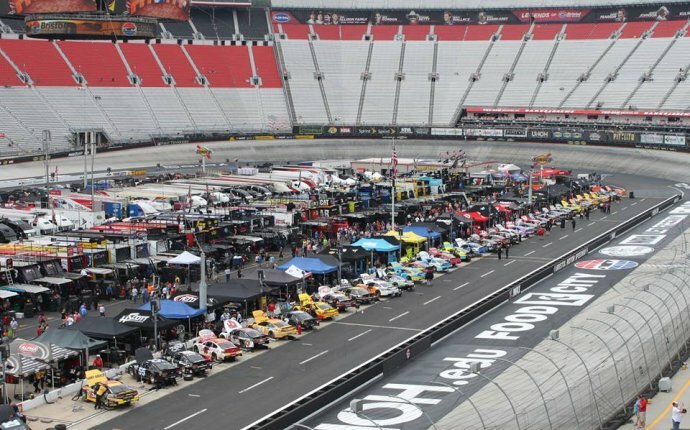 BRISTOL, Tenn. – Kurt Busch remains the active leader in NASCAR Monster Energy Cup wins at Bristol Motor Speedway along with brother Kyle as both drivers boast five career triumphs at the track. Past success, however, is becoming quite distant for the elder Busch, who hasn’t won at Bristol since 2006. Busch’s success at BMS came under the old bump-and-bang setup, and for the second straight race, speedway officials plan to apply plentiful amounts of a sticky compound resin known as VHT to the oval’s lower groove in an effort to entice drivers down the track. With wet weather in the forecast for the weekend, questions are already rising over whether the VHT will be effective. Busch said it’ll be tough to rely on the extra grip from the VHT if the track doesn’t stay dry. While supporting the track’s attempt to reopen the lower groove to competitive racing, Busch said there may be a better way to address the problem. A morning rain and the threat of more afternoon storms altered the schedule at BMS on Friday as both Cup and K&N qualifying were wiped out. Drivers, however, in the end still got to hit the track during an early afternoon window of clear skies as the Cup, Xfinity and K&N series each got in one practice session. Rookie Erik Jones paced the Cup practice, turning in a fast lap of 15.009 seconds at 127.843 mph. He was followed close behind by Kyle Busch, Ryan Blaney, Martin Truex Jr. and Matt Kenseth. Chase Elliott had a spin across the start-finish line, while Joey Logano brushed the wall during the Cup practice session. @cc49ers I’m not saying never go to Cup racing, but she should’ve at least spent more time in Xfinity (Nationwide).